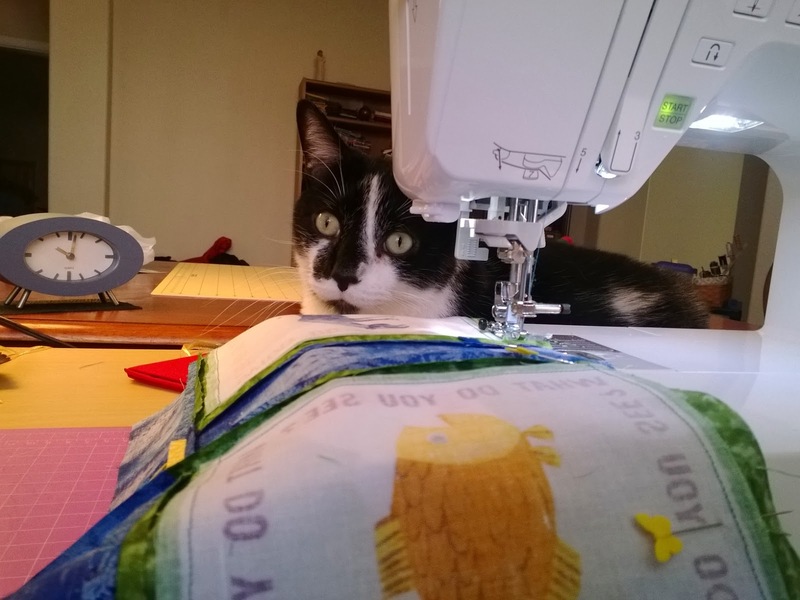 As a relatively new quilter, I am still learning big lessons with each and every project that I make. 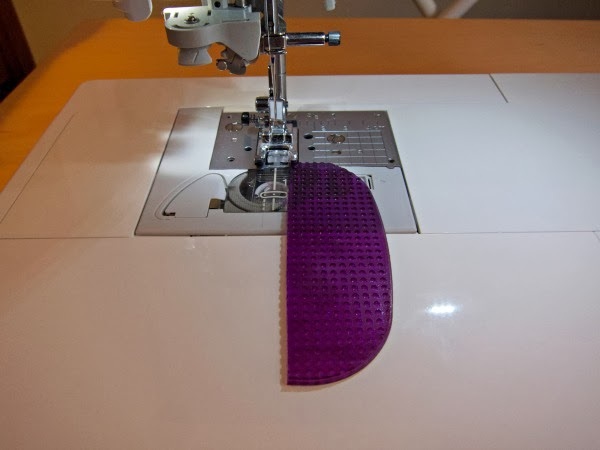 Some lessons deal with the mechanics of quilting, like fabric, thread types, and fun tools of the trade. 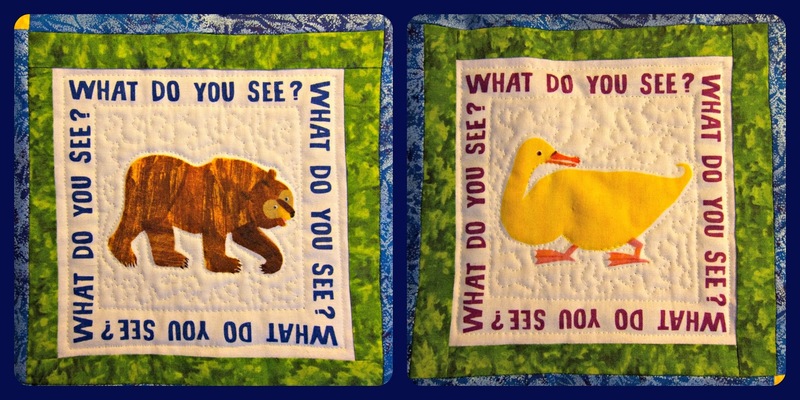 Other, sometimes bigger lessons, are about me as a quilter and what I like and dislike, what works for me and what doesn't. As I noted earlier, making scrappy log cabins didn't sit well with me so I remade them. I finished my Accuracy Quilt back in October but I still didn't have a backing for it and it's almost February. Until now. I finally finished piecing it yesterday and I can't begin to tell you how painful it was for me. When making the quilt top the biggest thing I learned on that project is that I'm more accurate when I press my seams open. The biggest thing I learned with the back - I HATE improv piecing. Okay, hate is a strong word - let's just say that I'm not very good at it and it caused me way more stress than it probably should have. In my everyday life, I like order. I guess it makes sense that I like order in my quilts. Lesson learned! 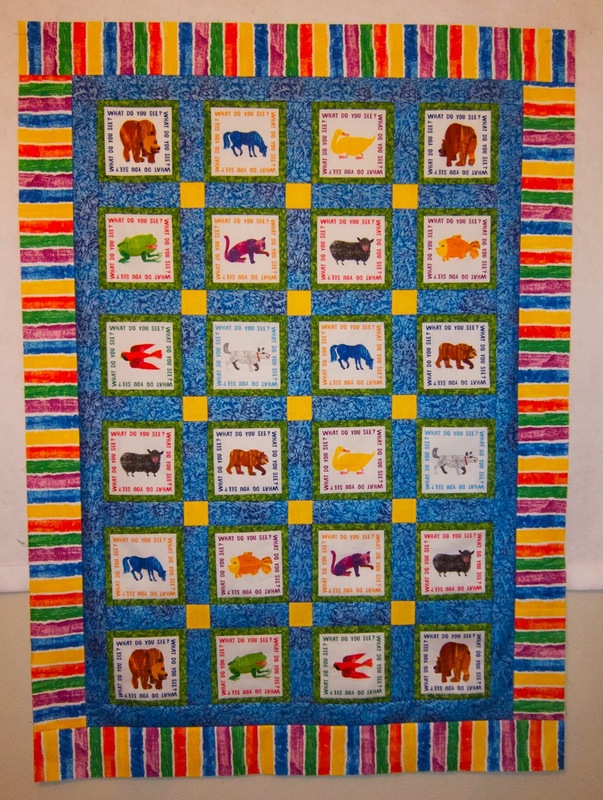 In a matter of weeks I finished up the Brown Bear quilt that I've been working on. 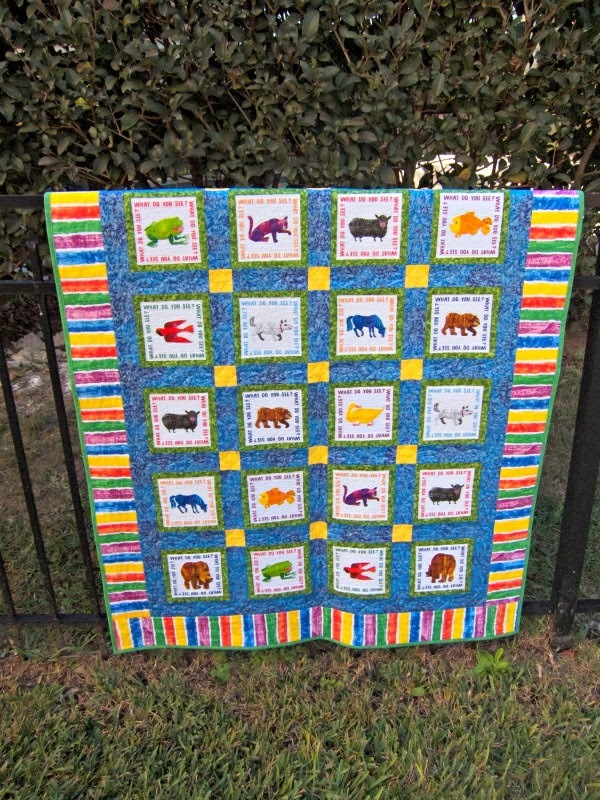 I'm so proud of this quilt and almost wish I could keep it for myself but it's for a very special person - my son's preschool teacher. When I mentioned this to someone recently, she was a bit surprised that I would spend so much time and effort to make something so beautiful and costly for someone I hardly know. Under different circumstances I might have agreed and knitted a cute little baby hat like I've done in the past. But not this time. This time is different because in the last few months we've learned that my 3 year old son has autism, dyspraxia, and sensory processing disorders. This past fall he started school in a 5-day-a-week intervention preschool program, one that specializes in working with preschoolers who are behind developmentally in an effort to get them up to speed in time for kindergarten. In that time we've witnessed him communicating more, even having short conversations with us. When he picked up a pen and drew a circle on a notepad, it brought me to tears. I don't take for granted the impact that a great teacher or mentor can have on a child. We still have a long way to go and no idea where this journey will take us but there are good people - special people - who are there to help us. THAT is why I chose to make this. Instead of adding the label after the quilt was done, I used the method that Kelly, from My Quilt Infatuation, shows in her tutorial. 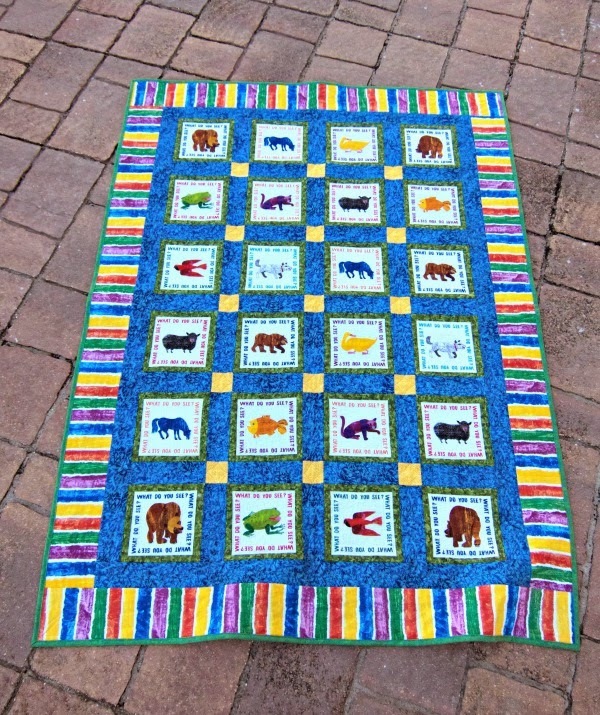 After much debating (on my part) I've decided I'm going to wash this quilt before I gift it, mainly because I'm dying to see what it looks like all soft and crinkly. Now I just have to wait until March! 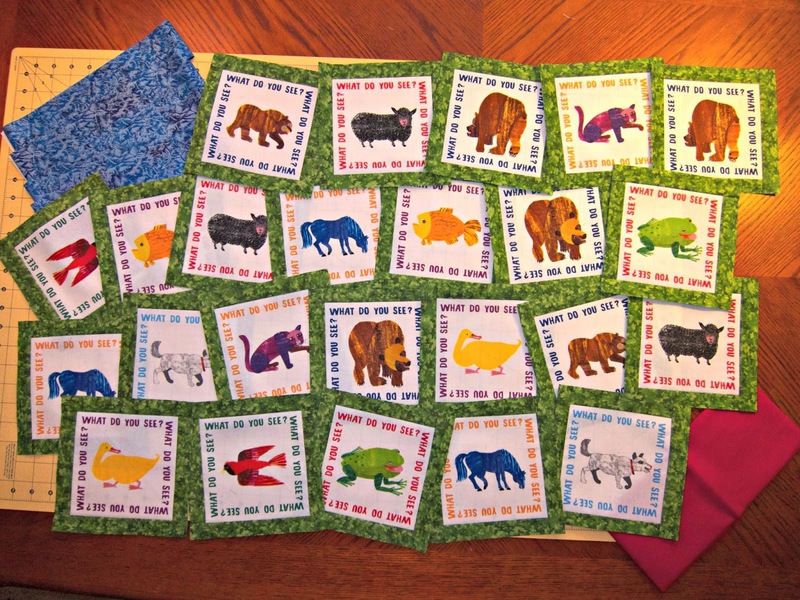 Earlier this month I decided to participate in the 2014 Sewalong hosted by Caroline from the SewCanShe blog. It was a straighforward challenge - make a project of your choosing with mini log cabin blocks. 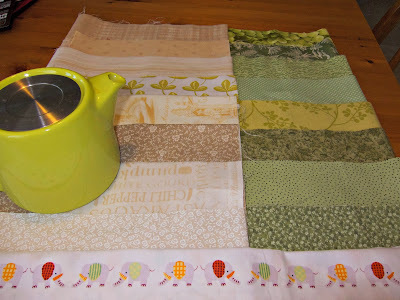 I decided to make a little mat for my teapot using green and cream fabrics and little elephants in the center. For the quilting I outlined the elephant blocks and in the cream area of the mat I quilted a center flower that feathered out to the ends. In the green areas I just did some loops. For the coasters, I just did some loops and ribbon candy. I'm much happier with these! It's not always accurate since the guide is a bit flexible. 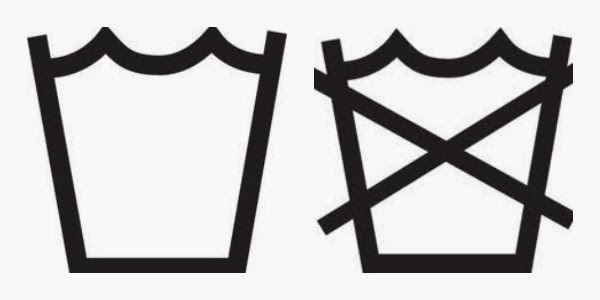 Also, the guide catches on exposed threads and can unravel them. This is particularly frustrating if I'm working with a fabric that frays easily. 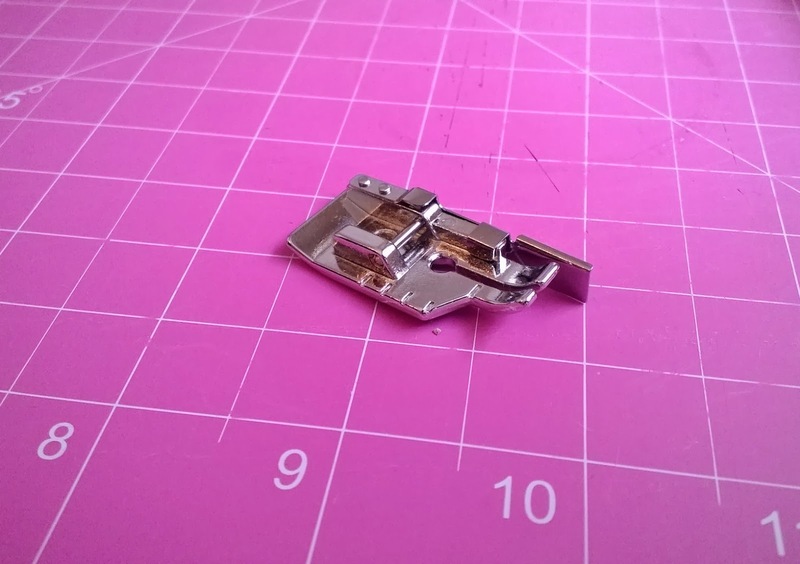 The other challenge with this presser foot is if I'm trying to sew across the center of a piece of fabric, like when sewing diagonally on a charm square to make half square triangles. I have to swap out presser feet. 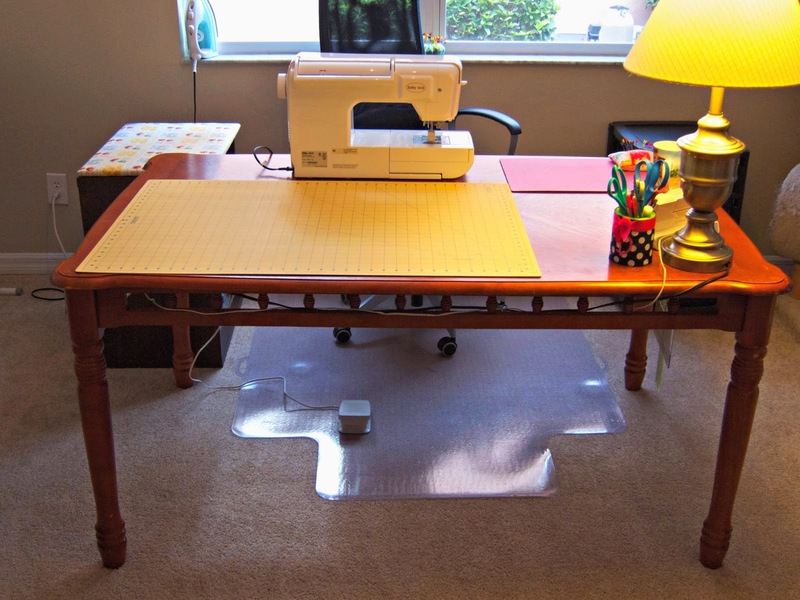 I then positioned it on my sewing machine and tested my seam allowance on a scrap of fabric and voila! A perfect scant quarter inch seam! I might end up making this into 2 strips - a small one to be placed on just the metal plate and one that will go on the white plastic part. I can't access the drawer that holds my presser feet unless I lift up the mat. If you have one of these lying around definitely try this trick, you won't regret it! I know there is the great debate on whether or not to prewash fabrics before cutting and sewing them into a quilt. This is NOT that question. I'm lazy and take my chances and don't prewash my fabrics. No, my question has to do with a completed quilt this is going to be a gift for someone else. 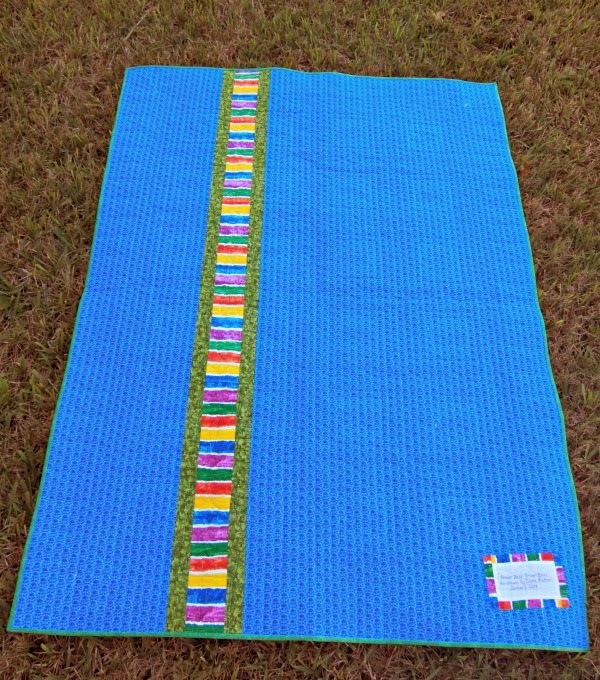 During the past year I've made a lot of smaller quilted gifts - placemats, table runners, and mug rugs. 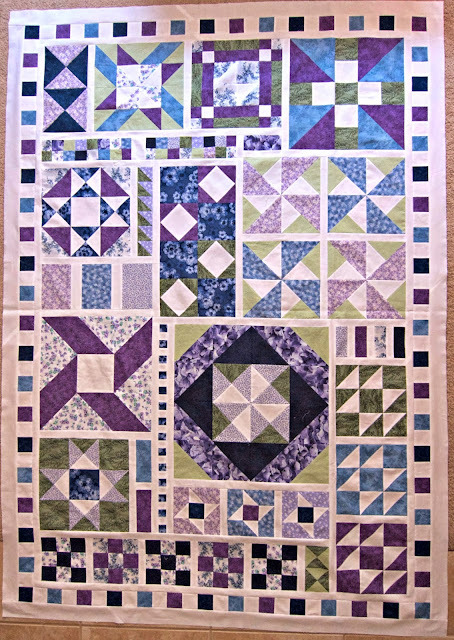 This evening I finished my 3rd quilt. 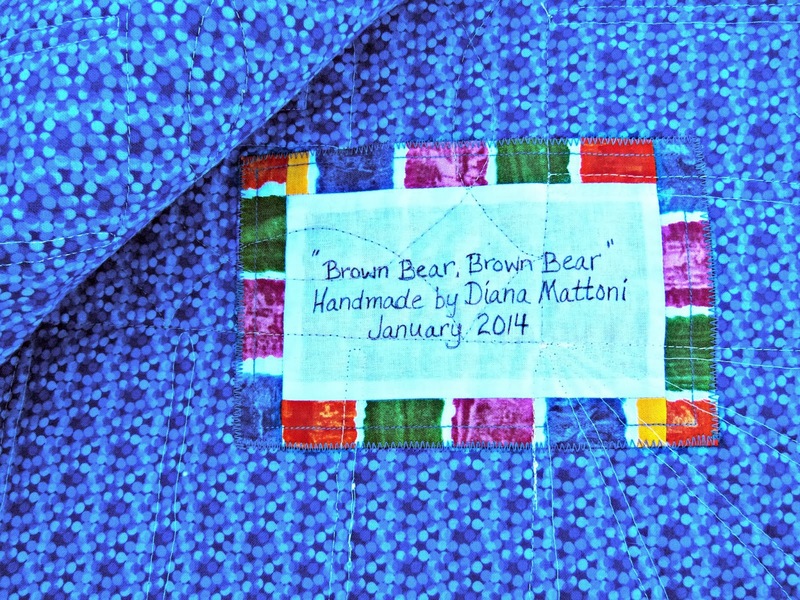 Many of you more experienced quilters are probably laughing since you've probably lost count of the number of quilts you made - but for me the Brown Bear quilt is only the 3rd one I've made. And it's a special gift for someone (more on that in another post). 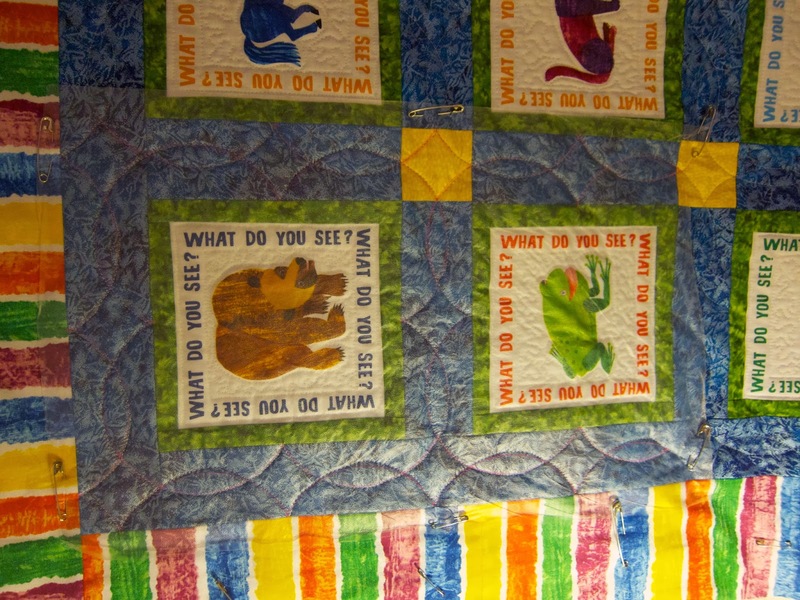 Having never gifted a quilt to someone before, I'm not sure if I wash it first myself so that it crinkles up nicely or if I let them wash it. Regardless of who washes it, a couple of color catchers will be accompanying it through the washing machine just to be safe. So, should I wash my quilt before I gift it or not? Sorry, not the greatest quality but you get the idea. Try as I might, I couldn't reproduce this pattern without marking it out. Okay, I could roll with that. Then came the road block. 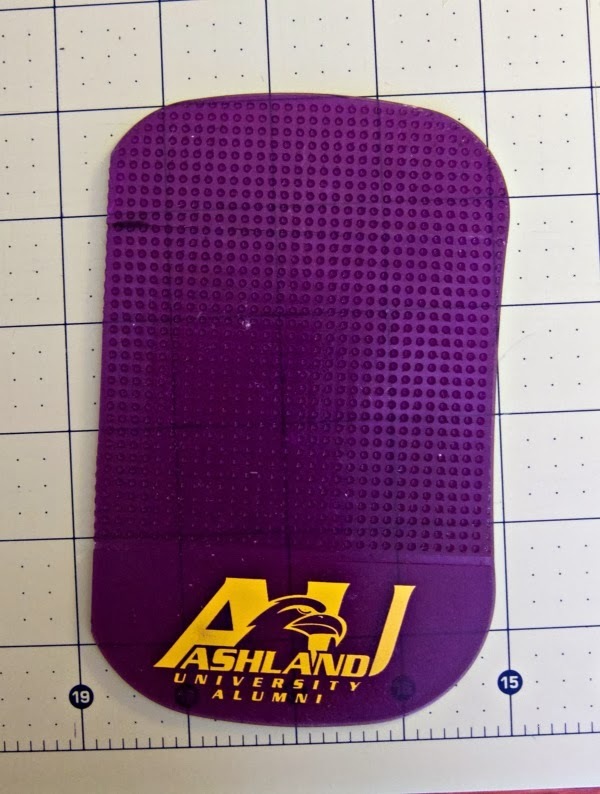 No matter what I used, nothing would show up on that metallic fabric. I tried disappearing marker, frixion pens, chalk, white fabric pencil, and soap slivers. Just couldn't see the markings well enough in order to quilt it. I was almost ready to scrap this pattern and opt for straight line quilting when I remembered reading about Glad Press'n Seal. 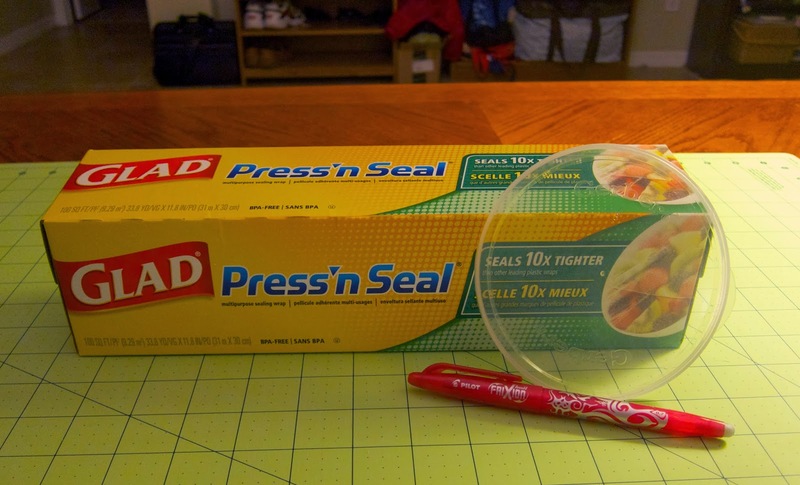 Besides being a great tool to audition what a pattern will look like on a quilt top before using thread, did you know that you can actually quilt right through Press'n Seal? 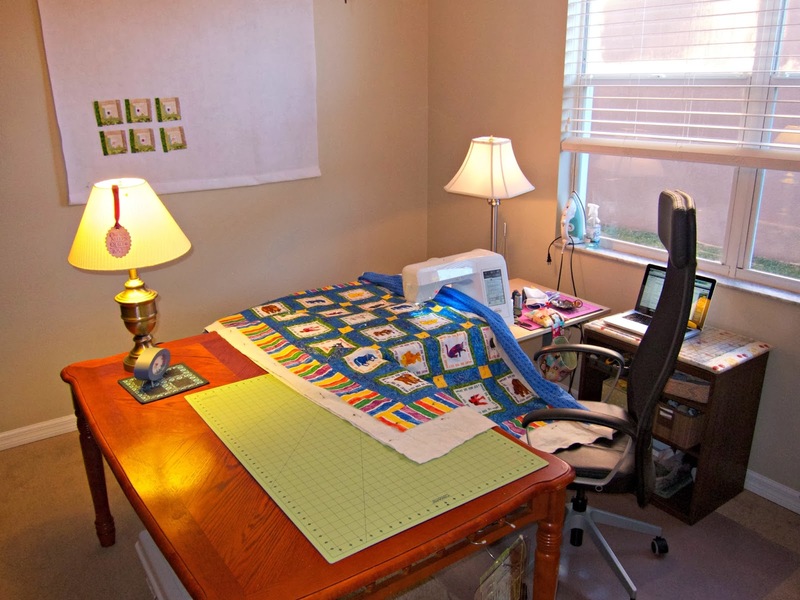 I did a search online and found some other quilters who've done it with great success. The main concerns that I'd read were the possibility of your pen markings transferring to fabric and removing the press'n seal from corners. I tested out a few different marking tools to see what worked best and opted for a bright pink frixion pen. It dried quickly and I could even wipe it away with a damp paper towel if I needed to re-mark something. I was going to add the figure eight portion of the design free hand but I think it might be too busy so I'm going to leave it as it is. Now all I have left to do is the striped border. In keeping with the more simplistic theme, I'm going to quilt piano keys about every 2nd stripe and put a feather in each of the square corners. With any luck, I'll have this finished and bound in a few days! 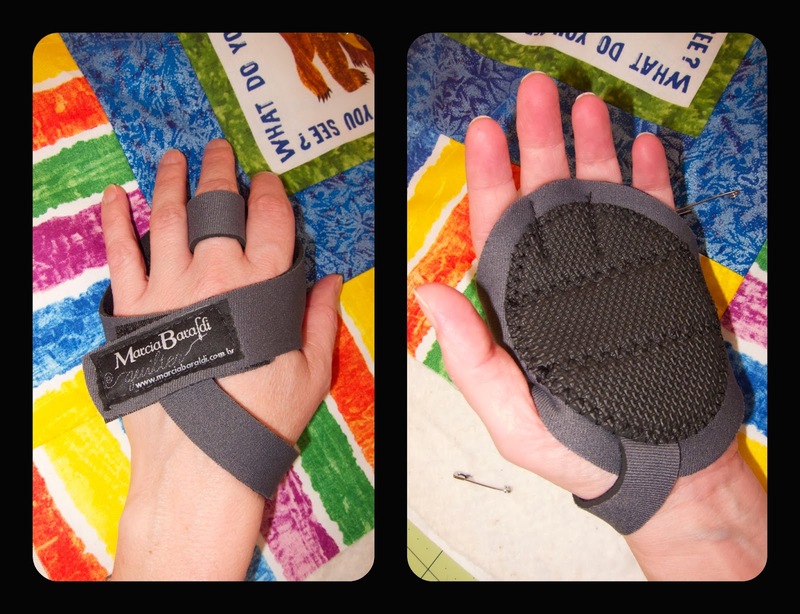 This past summer when I was participating in the Aiming For Accuracy Quilt Along, I won these new quilting gloves, by Marcia Baraldi. 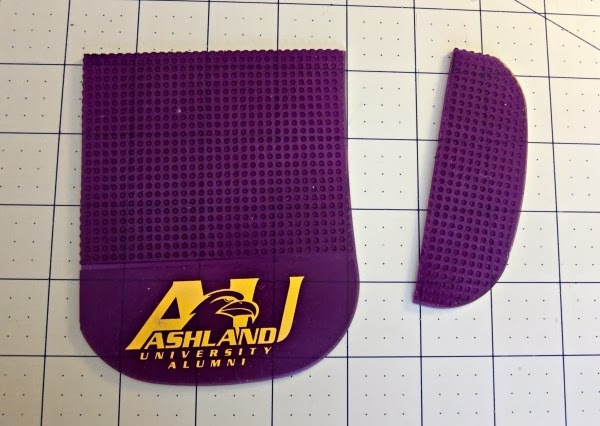 I've always used these tight fitting garden gloves whenever I quilted and really loved the control they gave me when moving the quilt during free motion quilting. What I didn't like about using my garden gloves is that I had to remove them every time I started/stopped to pull my threads through the quilt. I've been using these new gloves for the last few days, determined to get used to them. What made these new gloves so appealing is also what makes them so challenging. Yes, it left my fingers open so that I could work with the threads and not have to remove the gloves but it made me realize that I primarily use my fingers when manipulating the quilt sandwich through the machine. I've had to readjust how I handle the quilt, leveraging more pressure on my palms and the heel of my palm, not my fingertips. It's getting easier, but it's not second nature. Not yet anyways, but I'm guessing it will be by the time I'm done with this quilt. By the end of December I'm usually ready to get back to the normal routine of things but there's always a part of me that misses the soft glow where the Christmas tree used to be lit, or sneaking one more holiday cookie after dinner, or enjoying family time at Great Wolf Lodge's Snowland experience. What's that, you ask? Well I'll tell you. During the holidays Great Wolf transforms all of their lodges into a winter wonderland complete with decorations, visits from Santa, and even a life-sized Gingerbread House where you can dine inside! 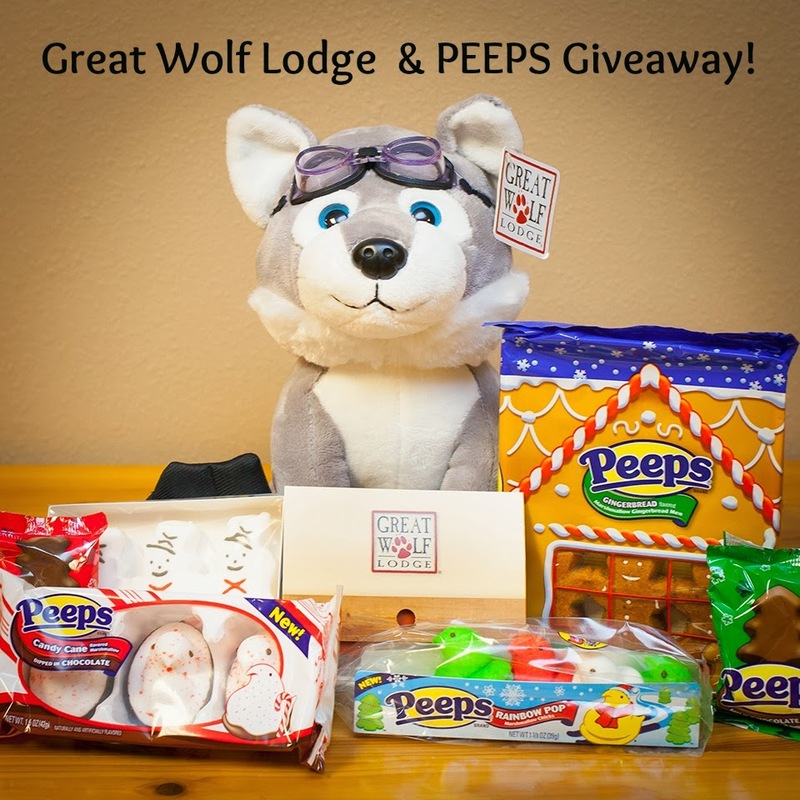 No Great Wolf Giveaway would be complete without an adorable Wolf Pup Plush and to sweeten the deal even more, they'll be tossing in a $50 Great Wolf Lodge Gift Card that you can use on your next stay! Entering the giveaway is easy. Simply use the Rafflecopter below for a possible 2 entries. Open to U.S. residents only. The winner will randomly be chosen on January 17th. Good luck! Wouldn't you know it, it's the first of the new year and I'm already adding more things to my list of projects I want to make this year. 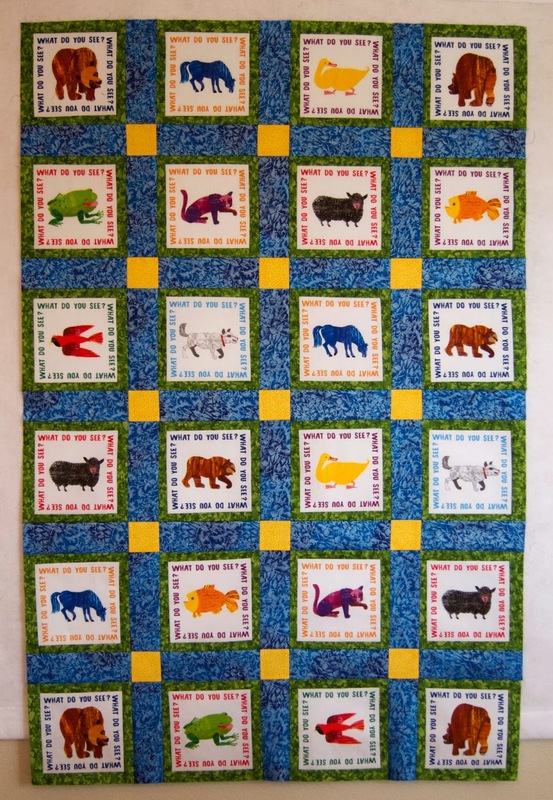 I've always thought log cabin quilt blocks were so cute and versatile and Caroline over at Sew Can She is hosting a sewalong that is too good to pass up. It's a project of your choosing using mini log cabin blocks that you'll make throughout the month of January. I think I'd like to make some placemats for our kitchen table and maybe a special placemat for my adorable tea pot that my brother's family got me for Christmas. So if you're feeling up to, why not join me? 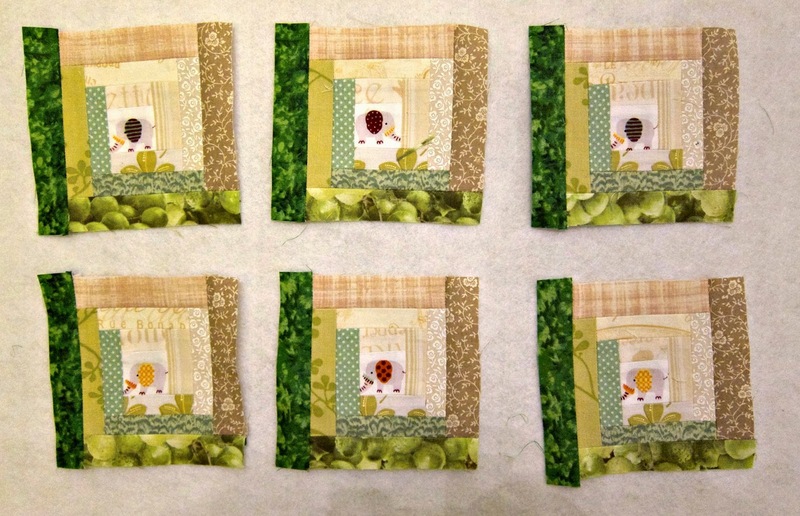 It's already shaping up to be a fun group of quilters. Rather than make a long post about 2013, I revised one of my tabs to show the various finishes that happened in 2013. I made a pretty good dent in being crafty, even if it was a lot of smaller projects. The only thing that's not included in those projects was the one that took up the most of my time this year - my Aiming of Accuracy Quilt. 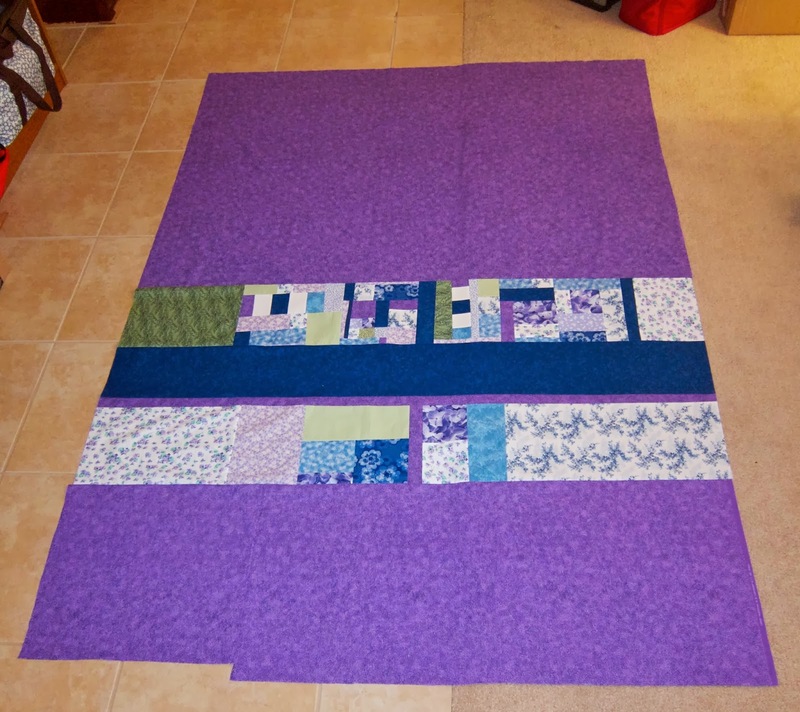 The top is done but since I haven't quilted it, I'm not considering it a true finish. But here's a picture of it, since it's worth including in my work for 2013. Happy New Year & Best Wishes for a Quilty New Year!